Suggested Use: 2 tablets, in the evening, for the first three months. Thereafter, 1-2 tablets daily. Source Naturals recommends that a minimum of 15 mg of coQ10 be taken daily per tablet of policosanol. Some research suggests that coQ10 levels in the body may be lowered by compounds that work on the same metabolic pathway as policosanol. 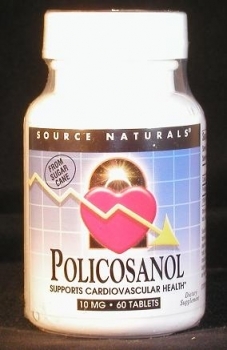 Policosanol is a mixture of long-chain fatty alcohols obtained from the waxes of sugar cane and other plants.